Each year, many McGill graduate students apply for prestigious Tri-Council Graduate Fellowships to supplement the cost of their graduate education. Supported by the Social Sciences and Humanities Research Council (SSHRC), Natural Sciences and Engineering Research Council (NSERC) and Canadian Institutes for Health Research (CIHR), these distinguished awards are chosen through a national competition. Stéphanie Sabbagh, a second-year M.Sc. student in Natural Resource Sciences, receives feedback on her fellowship application from Prof. Ian Gold, the Canada Research Chair in Philosophy & Psychiatry at McGill. To enhance the chances of applicants, McGill this year introduced Would You Fund It?, a workshop that provides graduate students the opportunity to sit down with a McGill professor for individual consultations on their applications. Would You Fund It? was developed by SKILLSETS, a professional development program offered by Graduate and Postdoctoral Studies and Teaching and Learning Services. This year’s workshop had 44 professors (each with prior experience as a reviewer for the Tri-Council funding agencies) volunteer to meet individually with students, review drafts of their fellowship applications and share their feedback and insight. Faculty members usually give feedback to the students they supervise. 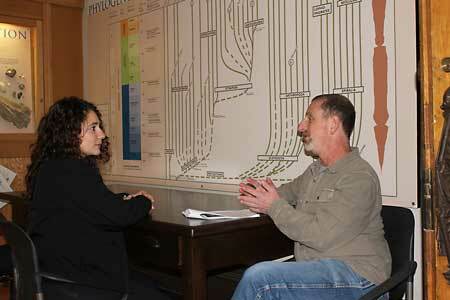 This new one-on-one initiative provides an additional opportunity for faculty review. With Would You Fund It, faculty reviewers outside the applicant’s specific area of research read each application with a fresh set of eyes, mirroring the way that the Tri-Council conducts its reviews. Feedback from students has been very positive. This was the first such event, and both faculty and students agree that it went very well. “I thought the whole thing ran absolutely smoothly and did the job,” said Gold. In the spring, when the results of the Tri-Council awards are announced, SKILLSETS plans to follow-up to see how many of the attendees are successful in their applications, and how the program can be improved for next year. Michael Sornberger is a Ph.D. student in School/Applied Child Psychology in the Faculty of Education.